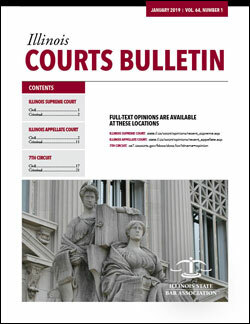 The Illinois Courts Bulletin is the ISBA's monthly print compendium of Illinois Supreme Court, Illinois appellate court, and seventh circuit court case summaries organized by subject matter. Redesigned in January 2019, the bulletin is a great way to quickly review caselaw that pertains to your practice. The bulletin is only $60 per year for ISBA members and $120 for nonmembers. Don't miss another issue.